Today is a day to channel your inner self – watch any of the Star Wars movies – heck why not have a marathon? That’s probably what Bacon’s parents are going to do here at the Hotel Thompson. Who is your favorite character? Favorite line? Why not dress up like your favorite character while having your marathon movie night? Learn some Star Wars trivia to play tonight. I even came up with some trivia for you to know so that you can awe all of your friends. Did you know that Carrie Fisher, Sissy Spacek, Farrah Fawcett, Barbara Hershey, Bernadette Peters, Margot Kidder, Meryl Streep, Sigourney Weaver, Cybill Shepherd, Jane Seymour, Catherine Hicks, Kathleen Turner, Linda Blair, Pamela Sue Martin and Cindy Williams were some of the few that auditioned for the roll of Princess Leia? Did you know that Luke Skywalker’s original name for the movie was Luke Starkiller? Did you know that David Prowse from Bristol play the role on screen of Darth Vader and his Vader’s voice was done by James Earl Jones. The kicker was that Jones was so convinced the film was going to flop, he refused to allow his name in the original credits. Did you know that Chewbacca was modeled after George Lucas’ dog, Indiana? And of course, we can’t leave Bacon’s mom out on this special day. 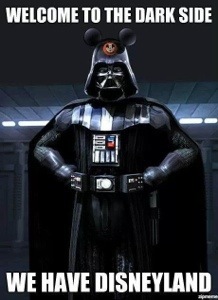 I found a picture of Dark Vader just for her – chitter chatter. Have an awesome day friends – May the Fourth Be With You!